Relieves minor aches and pains associated with the flu or common cold. Trending at C $18.76eBay determines this price through a machine-learned model of the product's sale prices within the last 90 days. Equate Children's Ibuprofen 100 mg Pain Fever Oral Suspension Bubble Gum - 8 Oz Per Bottle X 5 Pack = 40 Oz Per Listing -​ Box may be slightly damaged and the contents are NOT affected - PLEASE ADD US TO YOUR FAVORITES BY CLICKING BELOW, AS WE ARE ADDING NEW ITEMS DAILY -. ADVIL - Ibuprofen 100 mg Children's Fever Reducer/Pain Reliever Fruit - 4 fl. When fever is running through your house, turn to Children's Advil Suspension to reduce fever fast . Up to 8 hours of relief with just one dose for children aged 2-11. Trending at C $18.20eBay determines this price through a machine-learned model of the product's sale prices within the last 90 days. Contains ibuprofen. Temporarily relieves minor aches and pains due to the common cold, flu, sore throat, headache, and toothache. Temporarily reduces fever. Advil Child Suspension Bubble Gum 4oz Uses temporarily:reduces fever, relieves minor aches and pains due to the common cold, flu, sore throat, headaches and toothaches. FREE Trial ! Relieve your little one's cold or flu symptoms for up to 8 hours with Advil Children's Suspension Liquid. Ideal for temporarily reducing fevers and also minor aches and pains. Ibuprofen 100 mg fever reducer/pain reliever (NSAID) per 5 ml. CHILDREN'S ADVIL. FEVER, ACHES & PAINS. GRAPE FLAVOR. EACH BOX INCLUDES 4 FL OZ - 28 FL OZ TOTAL. EXPIRATION BY BOX: (1) 01/2020, (4) 08/2020, (1) 11/2020 & (1) 04/2021. Children's Advil® Fever Reducer Pain Reliever.Ibuprofen 100mg Fever Reducer/Pain Reliever (NSAID) per 5mL. Alcohol Free. For Ages 6 mos. reduces fever. Temporarily : Relieves minor aches and pains due to the common cold, flu, sore throat, headaches and toothaches, teething and immunization. Alcohol Free. Bring your child fast fever reduction and relief from minor aches and pains with Children's Motrin Oral Suspension. Containing 100 milligrams of ibuprofen per teaspoonful, this product provides up to eight hours of relief from minor aches and pains due to the common cold, flu, sore throat, headache, and toothache. Reduces fever for up to 8 hours. 5 mL: Ibuprofen 100 mg. Fever Reducer/Pain Reliever. Temporarily: Reduces fever. Relieves minor aches and pains due to the common cold, flu, sore throat, headaches and toothaches. Active Ingredients. In Each 5 mL: Ibuprofen 100 mg (NSAID) (Nonsteroidal Anti-Inflammatory Drug). PRODUCT DETAILS. Temporarily: relieves minor aches and pains due to the common cold, flu, sore throat, headache and toothache; reduces fever. Contains Ibuprofen Oral Suspension 100mg per 5mL (teaspoon). Pain Reliever - Fever Reducer. Alcohol Free. CHILDREN'S ADVIL. FEVER ACHES & PAINS. FRUIT- FLAVORED LIQUID. EACH BOX INCLUDES 4 FL OZ- 16 FL OZ TOTAL. ALL EXPIRE: 06/2019. Contains ibuprofen. Uses: Temporarily reduces fever; relieves minor aches and pains due to the common cold, flu, sore throat, headaches and toothaches. Pain reliever/fever reducer. On occasion, manufacturers may improve or change their product formulas and update their labels. Advil Children's Liquid Suspension, Bubble Gum, 4oz (EXP DATE: 12/01/2019). This product is intended for use in children ages 2 years – 11 years. This product does not contain directions or complete warnings for adult use; do not give more than directed; shake well before using; find right dose on chart below. Contains Ibuprofen Oral Suspension 100mg per 5mL (teaspoon). Non-Staining Dye Free. Products will expire no later than six months to 1 year after receipt. Weight: 9.47 oz. Alcohol Free. UPC: 300450184047. Children's Advil Fever Reducer Pain Reliever. Ibuprofen 100mg Fever Reducer/Pain Reliever (NSAID) per 5mL. Aches & Pains. Aches & Pains. Great Convenience. Alcohol Free. Let pain or a fever sideline your kids?. Not a chance. 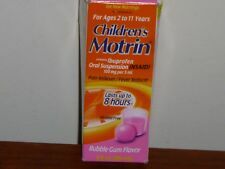 For your kids' high fever, nothing works faster or lasts longer than Children's Motrin, now with a burst of grape flavor. Children’s Motrin treats pain and fever, providing relief lasting up to eight hours. In Each 5 mL; Ibuprofen 100 mg (NSAID [Nonsteroidal Anti-Inflammatory Drug]). Temporarily: reduces fever; relieves minor aches and pains due to the common cold, flu, sore throat, headaches and toothaches. Bring your child fast fever reduction and relief from minor aches and pains with Children's Motrin Flavored Pain and Fever Reducer Liquid Syrup. With 100 milligrams of ibuprofen per teaspoonful, this kids pain reliever provides up to eight hours of relief from minor aches and pains due to the common cold, flu, sore throat, headache and toothache. Leader Childrens Dye-Free Ibuprofen Oral Suspension 100mg per 5mL. Leader Children's Dye-Free Ibuprofen, 100mg/5mL, 4oz (EXP DATE: 12/01/2019). Pain Reliever. We want you to be happy! Image & product details will be revised promptly if there are any changes. Active Ingredients : Ibuprofen 100mg. Berry Flavored. Compared to the active ingredients in Children's Motrin! For ages 2-11 years. Advil Children's Liquid Suspension, Grape, 4oz (EXP DATE: 12/01/2019). Children's Advil® Fever Reducer Pain Reliever. Ibuprofen 100mg Fever Reducer/Pain Reliever (NSAID) per 5mL. Alcohol Free. We want you to be happy! Contains ibuprofen. Active Ingredients: In Each 1.25 ml: Ibuprofen (50 mg) (NSAID). Uses: Temporarily reduces fever; relieves minor aches and pains due to the common cold, flu, sore throat, headaches and toothaches. Children's Motrin Ibuprofen, Berry, 4oz (EXP DATE: 04/01/2019). Contains Ibuprofen Oral Suspension 100mg per 5mL (teaspoon). Active Ingredients: in each 5mL: Ibuprofen (100 mg) (Pain reliever/fever reducer). 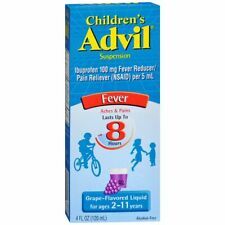 Children's Advil Fever Suspension, White Grape, 4oz (EXP DATE: 12/01/2019). Ibuprofen 100mg Fever Reducer/Pain Reliever (NSAID) per 5mL. Active Ingredients: Ibuprofen (100 mg) (NSAID). We want you to be happy! Equate Children's Ibuprofen 100 mg Pain Fever Oral Suspension Bubble Gum - 8 Oz Per Bottle X 10 Pack = 80 Oz Per Listing -​ Box may be slightly damaged and the contents are NOT affected - PLEASE ADD US TO YOUR FAVORITES BY CLICKING BELOW, AS WE ARE ADDING NEW ITEMS DAILY -.